Hello Lark & Linen readers. Kaylee back from The Blondielocks with a crepe cake that is sure to bring a single tear to any dessert lovers eye. 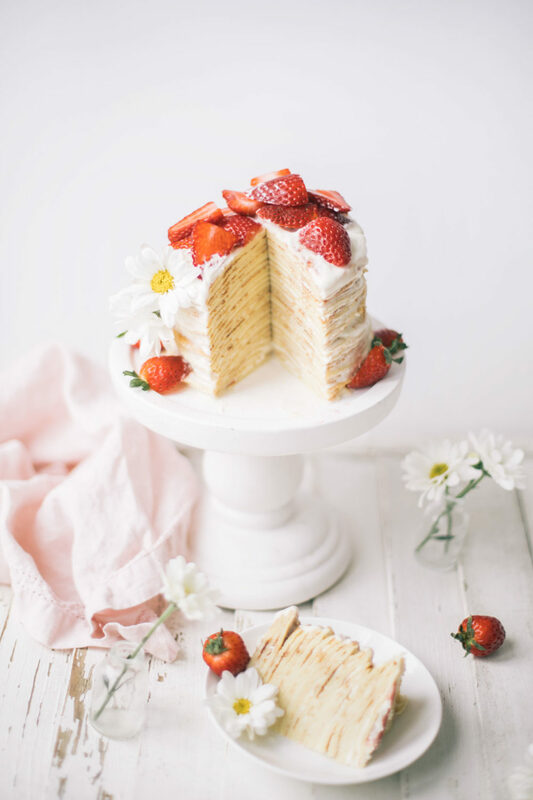 I recently stumbled upon this strawberry-chamomile naked cake on one of my favourite food blogs, Half Baked Harvest, and was immediately inspired to create a dessert that incorporated strawberries and chamomile myself. I love this time of year because all of the fresh produce and flowers are starting to arrive at the markets, and I sure do love working with both of those things in my baking. 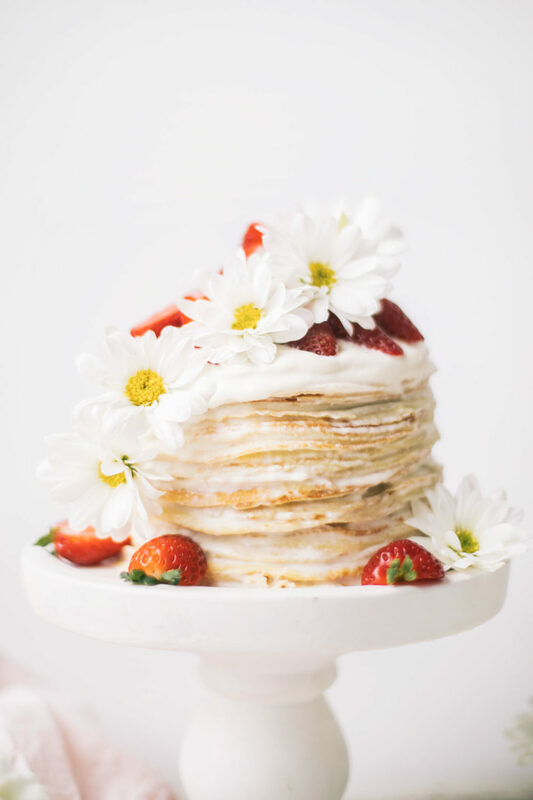 This was actually my first time ever attempting a crepe cake and while it was definitely a little touch-and-go at the beginning, I am so thrilled with how this mini crepe cake turned out and even more thrilled with the delicious flavour and texture that it offers. 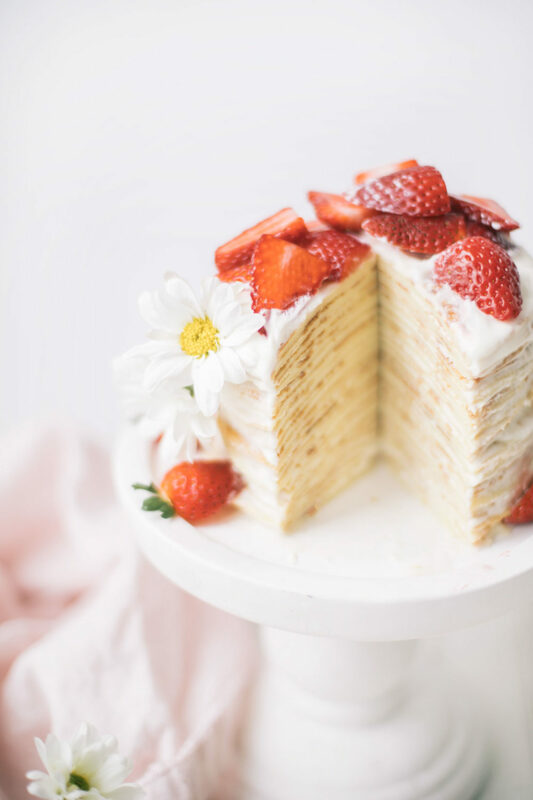 There’s truly nothing like light fluffy crepes, and when paired with a honey-whipped cream, the soft floral notes of chamomile and fresh, bright and tart strawberries there’s a match made in dessert heaven. Happy spring! -Add water and sugar into a small saucepan on high. Once sugar is dissolved and mixture comes to a boil, take the mixture off the burner. -Add tea bags and steep for about 20 minutes. Squeeze tea bags to get any excess juice out and then toss them. -Place mixture into a jar and cool in the fridge completely. Syrup will stay good for up to 2 weeks. -Combine flour, sugar, salt milk, eggs and butter into a blender and puree until the mixture is smooth and bubbles form at the top (about 30 seconds). -Transfer mixture to an air tight container and leave in the fridge for at least 1 hour up to 1 day. -Remove crepe mixture from the fridge and whisk before using. Heat a 5-6” non-stick skillet over medium low (3.5 worked perfectly for me). Melt 1/8 tsp of butter on the pan and once melted, spoon a small ice cream scoop worth of crepe batter onto the pan. The batter should be just enough to evenly cover the bottom layer of the pan. Remember, crepes are very thin pancakes. You can also swirl the pan around to help create an even layer. -Cook the underside of the crepe until it is golden brown 2-3 minutes. Loosen the edges of the crepe with a small rubber spatula and quickly flip. Cook for about 1-2 minutes more. -Continue cooking crepes using the same method, coating the pan with 1/8 tsp of butter as needed. Each time a crepe is complete, move it to a plate to cool. Once cooled, you can begin stacking the crepes with wax paper in between and transfer them into the fridge to cool completely. You will need about 20-25 crepes for your cake. -While the crepes are cooling in the fridge, make your whipped cream. -Add whipping cream and honey into a chilled mixing bowl. Using a hand mixer, whisk on high speed until stiff peaks begin to form. -Add 1 tbsp. powdered sugar to stabilize the whipped cream to make it easier to work with. -Place your first crepe onto the plate or stand. Dip a pastry brush into the chamomile syrup and gently swipe it onto the crepe. -Scoop about a ½ tbsp. of whipped cream onto the center of the crepe and using the back of the spoon, gently work the whipped cream from the inside out over the crepe. Place your second crepe down and press gently. -Continue the chamomile syrup brushing + whipped cream topping method for all of your crepes except for the final crepe. -Once you read the top of your cake, scoop a bit more whipped cream onto the top, creating a nice pillow of whipped cream. -Top and serve with lots of fresh strawberries and enjoy!